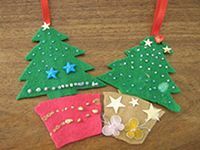 This a a very easy and fun craft for kids to do as there are no difficult parts and they can do all of the work themselves, ages 4+. Hours of holiday fun making decorations for the house for Christmas. Read through all the instructions first before starting this craft.Make sure you have all required items on hand. 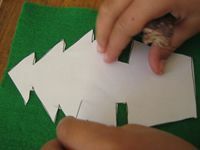 Cut out your paper pattern pieces with a paper scissors.  Pin your paper pattern pieces each onto a piece of felt that is the correct colour for your piece. 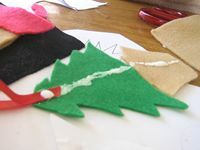 Cut out your pieces, but be careful if you're using a fabric scissors not to cut into the paper pattern! Cutting paper with fabric scissors can make them blunt!!! Cut a piece of ribbon about 7cm long and fold it in half. Put glue on your pot and tree. 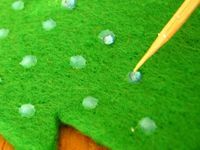 The best way to use fabric glue is to put a layer of it onto the felt making sure you have a lump, if it is too thin and absorbs into the felt it does not stick very well. 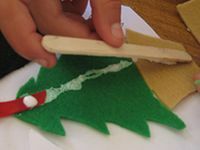 Place your ribbon at the top of the tree and put your ice-cream stick down on the glue and trap the ribbon between the felt and the stick with a drop of glue there too. Leave to dry for at least 2 hours. Turn your tree over and stick embelishments all over it with. 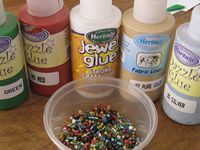 Stick beads and buttons on with jewel glue and use dazzle glue to draw patterns.